← The Sensation of Knowing When. Well, not really. This is most definitely NOT a recipe for cooking horsemeat! However, I will show you how to quickly, easily and gently form a bond with your horse that will probably last as long as each of you do. It requires a few things: You, your horse, a pasta fork (pictured) and time. Other methods of ‘bonding’ to your horse involve a lot more expensive things. You need a round pen, for instance. You need to have read a book or several by a man who claims that his method of bonding with a horse is based on equine behavior. His method involves a lot of sweat and energy expense on the horse’s part, and you need to be a bit of a bully. He has gained fame for taking so-called mustangs right off the range, inspired them to trust him so much that, within a few minutes, he can saddle, bridle and ride them (in the round pen). His method is basically using body language to make the horse run in circles in the round pen. No lead rope or lounge line is used, merely aggressive body language. He isn’t hurting them but establishing himself as the dominant creature. By forcing the horse to run away from him (in the round pen, where the horse has no escape), he is demonstrating to the horse that he is the master. The horse is pressured to keep moving until he gets tired and submits. Only when the horse submits, indicated by licking his lips or mouthing, does the man let up on the pressure. He does this by stepping into the horse’s path and glaring at it. The horse stops. Then he turns his back on the horse. The horse then goes up to him and apologizes, and walks with the man. It appears to work. I don’t see why it should be so psychically or emotionally strenuous. It works on horses born and raised in captivity. The man has made himself famous by using it to instantly ‘tame’ mustangs. I would like to see what sort of methods the man uses on the horse before it is ever run into his expensive round pen, in a clinic atmosphere, attended by a paying audience. Am I suggesting sedation for the mustang? Well, I dunno. I’ve seen mustangs run in from the range, and in no case were they ever the calm, if a bit nervous horse, that the man seems to find for his demonstrations of horse mastery. No, the mustangs I’ve seen have been ones chased by a helicopter or a dirt bike into a stock pen. They react as the wild animals they really are: with absolute terror and a desperate attempt to escape. I’ve seen them try to climb over an 8 foot high, steel piped stock chute in terror. My method was learned from 16 years of professionally massaging horses. I’ve massaged many, many horses, most of them in pain of one sort or another. I’ve never massaged a mustang right off the range, so I will give the man the benefit of the doubt. However, my way is far more pleasant for the horse, much less effort on the animal’s fault, and much more intimate. My way of bonding with the horse also uses equine behavior. It works with all horses, no matter how trained-or un-they are. It uses the same behavior as two horses use on each other. Horses, when they’re relaxing with another horse, engage in “social grooming’. I’m sure you’ve seen a pair of horses, head to head, apparently ‘biting’ each other on the withers and the back. They aren’t biting, they’re scratching. Like anybody who loves a good back scratch, horses scratch the spots on the other horse that they know are unreachable with their own teeth. They are literally scratching the other horse’s itchy spots. Strange horses don’t groom each other. Horses on opposite ends of the social ranking ladder don’t mutually groom. A high-ranking horse will allow a low ranking horse to groom him, but he won’t groom the lower ranking one. It’s a privilege, then, to allow another horse to groom you. They only socially groom horses they know, trust, like, or want to mate with. The last one you needn’t worry about. Your horse will not want you as a mate, no matter how good you look. If you want to forge a strong, natural bond with your horse, I will teach you how. It’s cheap, easy, fulfilling, and fun. You are going to emulate another horse, and socially groom your horse. You are going to scratch your horse. You may use your fingers. However, few people, (to include me, who’s been massaging horses for many years) have the necessary strength in their fingertips to really get into the horse. Also, your fingers tips are too blunt, too fat, to really get into an itchy spot on a horse. The best tool I’ve found for scratching a horse is a wooden pasta fork, used in Italian cooking (hence the title! ).You can find them in the kitchen section of most supermarkets or specialty cookware stores. The pasta fork must be wooden. Only wood has the necessary tensile strength and yet is forgiving enough to properly scratch a horse. 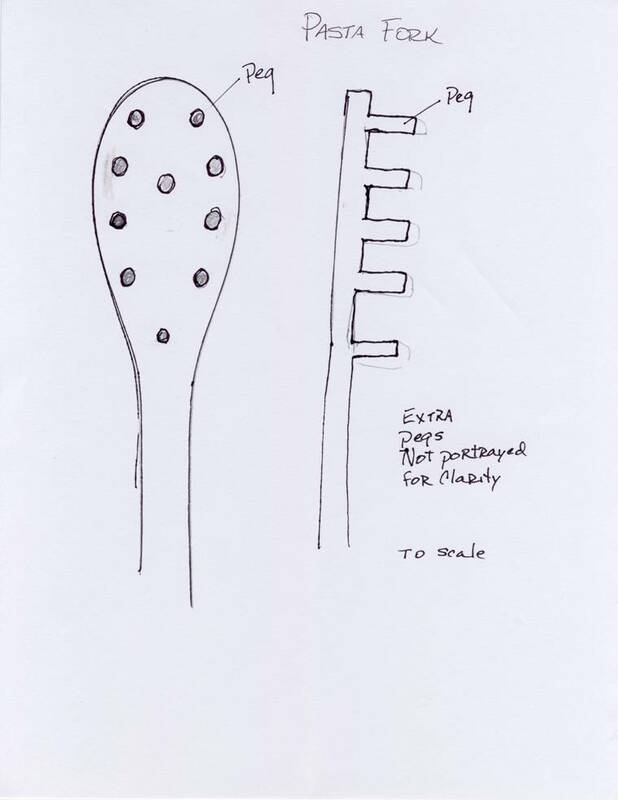 The above drawing, to scale, shows the typical pasta fork with pegs of about half an inch long. Wooden utensils are getting hard to find. They’re homely and not very flashy. Retailers want something that sells due to its appearance and they can charge a hefty price for, not because it’s effective and yet cheap. The market is flooded with fancy, silicon or metal forks or plastic junk from China. The peg ends should be round, beveled or flat, NOT sharply pointed. It should go without saying that sharp-pointed ends will hurt the horse. When you find wooden forks, buy several. They’re relatively inexpensive, and if the stock manager sees all the wooden ones going out the door and the modern ones staying in the inventory, he may just order more. The pasta fork must be the type with several pegs in the flat ‘face’ of the fork. See the picture. Do not use one with a scalloped edge around a bowl. A long-handled one allows you to use leverage, but it’s not necessary. You will find yourself grasping the head of it, which is fine. You may even want to cut off the handle, but the handle does allow you to increase the leverage or reach under a belly. You’re going to be putting a lot of pressure on the fork, using your wrist. I never massage a horse without using wrist supports, but you needn’t worry about that when scratching a horse. Now that you have all the equipment you need to bond with your horse, let’s get started. Take your horse into an area where you aren’t going to be interrupted by other, nosy horses. It can be anywhere. I like to scratch the horse in his stall, as then I can work on him without halters or lead ropes. Don’t halter or tie your horse. It’s not necessary, and I believe that the act of haltering a horse puts him in a frame of mind that something is going to happen. It may be work, or being doctored, or whatever, but it means something. You are about to socially groom your horse. It is supposed to be a relaxing time, a time when nothing is expected of your horse but his patience and standing in one place. If he’s never been scratched with a pasta fork, let him smell it. He may want to taste it or bite it. Allow him to do so on the handle, not the pegged face. Tell him you’re going to scratch him. When I’m scratching a horse, I use the word “scratch’ all drawn out………’scraaaaaaaaaaatch, scraaaaaaaaatch”. I’ll say, “Who wants scratches?” The word “scratch’ is his cue that you are going to groom him. Then, begin. Start scratching with your fingers in areas where you know he’s usually itchy. These spots are usually the withers, the shoulders, the sides of the neck, the brisket. 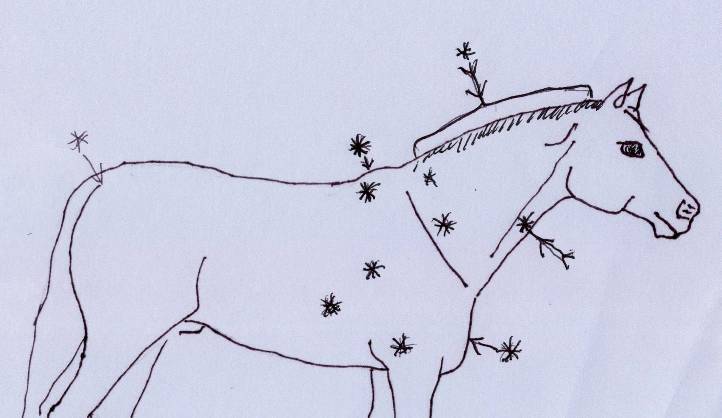 The asterisks in the drawing show where horses most often like to be scratched. It is not inclusive. Experiment, scratch him all over and see what he likes and what means nothing to him. The asterisks show the most common itchy spots on a horse. A good rule of thumb is to test for itchiness in areas where he cannot scratch (with his hoof) or with his teeth. His hoof? Yes. You would be surprised how much of their body they CAN reach with a hind hoof. I’ve watched my 19 year old Arabian scratch behind his ear with a hind hoof. Once you’ve found a spot that itches and evokes a reaction from your fingers, switch to the pasta fork. Most horses won’t even notice the switch, but some may. With a horse new to scratching, take it easy. Gently scratch him with the fork until he understands what you are doing with it. Experiment with how much pressure to use on the horse. You will be astonished at how much pressure a horse may want, and in what spots. Take it easy, and watch his reaction to scratching with the fork. His reactions will be unmistakable and immediately understood. The horse’s body language says “oooooh”. When you find a spot that itches, he will raise his head, or twist it right or left, purse his upper lip, shut his eyes, or his lips will tremble. He may do one or all of them simultaneously. Sometimes the nostrils will pinch, not from pain, but with pleasure. Sometimes, once he knows the pasta fork won’t hurt him, he will turn his head and touch the spot that’s itchy. He may begin biting it himself. Allow him to finish, then go right to the same spot and begin scratching it. If you are applying too much pressure, he will stop reacting with a pleasure look. He may swish his tail in irritation, pin his ears, fling his head or even move away. Apologize, wait a few moments for the irritation to subside, and continue scratching with a lighter pressure. If he still objects, move on to a different spot. Each horse is different. My Arab needs a hard pressure, my friends’ ginormous Hanoverian wants the lightest touch. Too light a pressure is tickling him, which is annoying, and too heavy a pressure can cause irritation. This is why the fork needs to be wood and made with pegs. It is the perfect material for applying and distributing the precise pressure the horse wants. Take your time. He will tell you when he’s had enough. Go over the spots you scratched earlier. If there is no reaction, he’s had enough at that spot. Just as in humans, the itch receptors in the skin get overloaded and stop being itchy. If he’s not itchy there anymore, go on to another, or just quit for the day. Being that we are vocal creatures, talk to him while you’re scratching him. Tell him how good it feels to scratch him, how happy you are to do it for him. Use the word “scratch’ often. In polite and civil equine society, social grooming is reciprocated. The horse new to your scratching him will want to ‘groom’ you in return. Do not allow it. Their teeth hurt and can injure you. They have no idea how strong their teeth are. Don’t be rude in rejecting his attempt to groom you. Thank him for offering to reciprocate, but say “No thank you, humans don’t like it.” This is for HIM because you are his friend. This is “you and me” time, horse. When he tries to nibble in reciprocation, stop scratching, gently but firmly press his nose away from you, and continue scratching. He will catch on that he is the total recipient and that he needn’t try to reciprocate. Some horses have itchy spots you wouldn’t believe. My neighbor had a lovely grey Arabian mare named Rose who adored having her udder scratched. Most mares will not allow anyone to touch their udder, but Rose was the opposite. The moment she saw a known udder scratcher approaching her, she would whinny a welcome and straddle her hind legs in the most obscene and suggestive stance. If your mare wants an udder scratch, be very gentle. In this case I wouldn’t use the pasta fork, merely your fingers. Be very wary the first time you touch her udder. A stamped foot, a kick, pinned ears, swishing tail…all mean Don’t Touch. Respect it. No means no, in any language, and in any horse. Other horses like having their docks (tail heads) scratched, bellies, especially the girth line, and under their chins. One spot they especially like is at the base of the mane, along the crest. This is where you must press down hard to get to the roots of the mane hairs. It’s where the pasta fork excels, because your fingers cannot exert that much pressure in such a small area. Again, judge how much pressure he wants. Do not be surprised if your gelding drops while you’re scratching. This is a high compliment, telling you your scratching is absolutely appreciated and he likes it. You will know you are pleasing him when he looks at you with a soft, loving eye. He will heave a huge sigh of pleasure. He is bonding with you. It may take only once. With my Arab, it took two scratching sessions. Once I finished scratching him, he had bonded with me. He followed me without a halter, without my urging, wanting to be with me wherever I went. This, in my experience, is a far more natural, pleasant, happy way of bonding with a horse. A pasta fork is far easier to transport and less expensive than any round pen and lessons. This entry was posted in Uncategorized and tagged equine behavior, equine body language. Bookmark the permalink.